through harmonic medicine, compassionate touch, and deep listening. For two decades, Alarra Saress has developed potent skills as a healing artist. Following her foundational BA in Philosophy she studied and received certification in Massage, Acutonics Sound Therapy, Ayurvedic Sacred Stone, Prenatal Bodywork, Aromatherapy, Holistic Health, Shamanic Studies, Spiritual Essence of Plants, “Body Into Being”: Advanced Energetic Somatic Training with Ray Castellino and Anna Chitty, and much more. Working with sacred sound has become a primary focus in Alarra’s healing practice. Her musical journey started early as a classically trained pianist. Over the years she has cultivated a multi-layered approach towards healing the whole through the intentional and technically gifted use of touch, voice, singing bowls, tuning forks, and most notably gongs. The magnificent and powerful 38" Sedna gong has become one of her principle healing instruments. Alarra’s passion is to aid each individual toward the fullest possible expression of their unique purpose by skillfully employing her specialized healing techniques within a safe, intuitive and compassionate space. 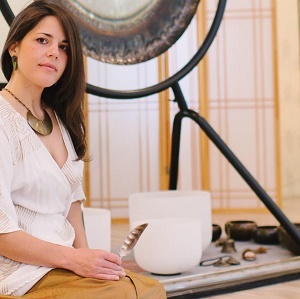 She also enjoys facilitating monthly Gong Meditation for the Ojai community. Alarra is also a professional recording artist. Alarra is also is also the founder of Harmonic Earth, a 501(c)3 nonprofit organization committed to providing bioarchitected sacred space environments for the performance and education of the healing arts. Visit Harmonic Earth. Currently practicing in Ojai, California, Alarra Saress has spent nearly two decades developing herself as a healing artist. Alarra's passion is to aid each individual toward the fullest possible expression of their unique purpose by skillfully employing her specialized healing techniques within a safe, intuitive, and compassionate space. “I highly recommend Alarra’s Gong Meditation, I attend them as often as I can. It is an exquisite, ineffable experience inside the infinite, ever expansive interior Universe, a profound journey of sound and vibration that touches the Heart, expands the mind and enlivens the Experience of one’s own consciousness in the Here and Now! “I highly suggest for an incredible evening go to Healing In America on the last Monday of the month and listen to Alarra and her sound journey meditation. I floated. I dreamt. I journeyed. I processed. I arrived. Working with sacred sound is a primary focus of my healing practice. Over the years I have cultivated a multi-layered approach towards whole-person healing through the intentional and technically gifted use of touch, voice, singing bowls, tuning forks, and now, at the center of my offerings, stands a powerful 38" Sedna gong. The magnificent 38" Sedna gong is one of my principle healing instruments. Her harmonic signature expands and challenges your ideas and assumptions about the very nature of the cosmos, opening you to new paradigms and non-duality, providing you with access into the deep layers of the personal and collective unconscious, your super conscious, and Universal intelligences. Gong meditation is powerful, beautiful, soulful, deeply embodying yet remarkably otherworldy. Physiologically this type of sound healing clears the nerve endings and regenerates the parasympathetic system (which is ruled by sound). The parasympathetic system sends “relax” messages to all the organs. It regulates the rebuilding functions of the body and it is vital for handling stress since it coordinates the recovery period from stress. In an individual or group treatment, you will be bathed in the multidimensional tones of planetary tuning forks, singing bowls, crystal didgeridoo, voice, and planetary gongs — an experience known to awaken, renew and expand consciousness. A truly lush aural and aesthetic experience can sooth, inspire, and nourish your spirit by aligning your inherently harmonic being. My background in music, astrology, and esoteric healing lends a dynamic power to these meditations. This is the quintessential magic carpet ride session – the convergence of a lifetime of learning and over a decade in practice. A natural touch healer since childhood, my evolutionary bodywork treatment will soothe and nourish your tissue while allowing your subtle body to awaken through the vibrational healing of Acutonics planetary tuning forks, singing bowls, essential oils, flower essences, sacred smudges like sage and palo santo, and other energetic modalities. This treatment builds on the powerful Pure Massage and expands it into a multi-dimensional sensory oasis. During your intake, an intention will be established for the treatment. Intention setting is one of the most important aspects of these treatments. Intentions can vary — from intending to release the stress of certain situations and/or ailments, to connecting more deeply with oneself, to integrating growth and change, and so on. When you define an intention, the precise healing energy of the treatment is more effective. You want to imagine that you are creating a pathway for your body-mind-soul composite to (e)merge. At the end of your session, you will be given space to rest in meditation to fortify the presence of the work. I recommend a 90-minute session. Acutonics, n. 1. System of vibrational sound healing rooted in Oriental Medicine and philosophy that utilizes tuning forks and symphonic gongs tuned to the planets, Tibetan bowls, bells, drums, and rattles. Connecting body, mind, and soul in the journey toward optimal health, harmonic attunement or at-one-ment with all things in the Universe. 2. The integral way, undifferentiated wholeness, the essence of Tao. “It’s like acupuncture with tuning forks instead of needles!” or “It’s like sound acupuncture!” One might hear such things about this intricate system. After a comprehensive intake, I apply tuning forks to your body’s acupuncture points for non-invasive access into the core energetic systems within the body. After the tuning forks have knit together your body’s harmonic presence, I will serenade you with gongs. The 38" Sedna gong is used to expand and challenge your ideas and assumptions about the very nature of the cosmos, opening you to new paradigms and non-duality, providing you with access into the deep layers of the personal and collective unconscious, your super conscious, and Universal intelligences. The 24" Venus gong brings beauty, harmony, creativity, and abundance, while opening us up to the power and potential of relationship. My strong background in astrology, esoteric healing, and music lends a dynamic power to this treatment. Harmonic Earth, a 501(c)(3) nonprofit organization committed to providing sacred space environments for performance and education of the healing arts. In the not too distant future, founder Alarra Saress along with Harmonic Earth’s council and supporters will build a harmonic temple from the ground up. For now, Harmonic Earth has anchored into an exquisite space to host the transformational medicine that we bring to this earth and to our communities, from our hearts – the elegant Healing In America building at 107 W. Aliso Street in Ojai, California. The Harmonic Earth location is available to Transformational Artists whose respected offerings are honorable, powerful and effective. Harmonic Earth will be your ally in bringing your classes, workshops, retreats, and dances forward. Alarra Saress and the team are available to assist you in creating and maintaining a sacred container. Embodied presence is an essential practice of coming home again and again to the center of being. At the center of being, all temporal realities dissipate into the expanded cognition of one’s interchange with source nature. At any given moment one may direct their attention to Presence, where all we are resides – always right there resting in a perfect spot. Fifteenth Century Indian mystic poet and saint Kabir said “Wherever you are is the entry point.” Sage advice. We are unique and dynamic beings, empowered with inner medicine which rests in our embodiment. As we continue the process of attunement through life’s rich dispensation of challenges, an authentic symphony of breath, feeling and form converges in our awareness singing us the wise song of ourselves – – empowering our inner medicine. On the inside we are intricate instruments of vibrating energy made manifest as flesh and bone. Instruments bend in and out of tune. When tuned, we can experience an astounding resonant harmony – clarity of thought, embodied presence, awareness of our intricate mystery. Harmonic resonance awakens and attunes creating a noticeable state change toward inner harmony. When the interior is illuminated as such, we often feel radiance. Our intention in creating sacred space is to cultivate a direct and felt experience of your inner medicine, that fountain of life that flows within you and structures your embodiment experiences. Your original self is intact and the unfoldment of that perfection is your heritage. As your nervous system regulate in the space of calm resonance, your wholeness awakens in your conscious awareness. Come entrain with the harmonic symmetry of your biocosmic blueprint at Harmonic Earth. Andrea Brook, international performing artist and yoga teacher, partners with Alarra Saress, sacred sound alchemist and founder of Harmonic Earth, in this unique and gentle transformative sonic yoga experience. Class starts promptly at 9:30am. If you are running late, please join us in silence. No yoga experience necessary. All levels welcome. We look forward to sharing this Mid-week Attunement with you. Please email Andrea or Alarra with questions. In a space of resonance, your wholeness awakens in your conscious awareness. Our intention for these weekly classes is to cultivate felt experiences of embodied wholeness through slowing down, grounding presence, and co-regulating our nervous systems as a group. Class includes lecture, discussion, and meditation. A truly beautiful aural and aesthetic experience, the harmonic resonance of the Sedna gong reduces stress and nourishes the nervous system. It soothes, inspires and bathes your being in sacred cosmic sound. As we lie down and rest in harmonic waves we experience more keenly attuned states of awareness. Bring yoga mat and blanket. Join the facebook group for updates. The Communion offers a safe place to dance in a sacred container; essential silence and uninhibited movement are celebrated in this conversation-free zone oriented to achieving transpersonal states through prayerfully sensual dance. Stay connected on facebook.